Hi everyone! 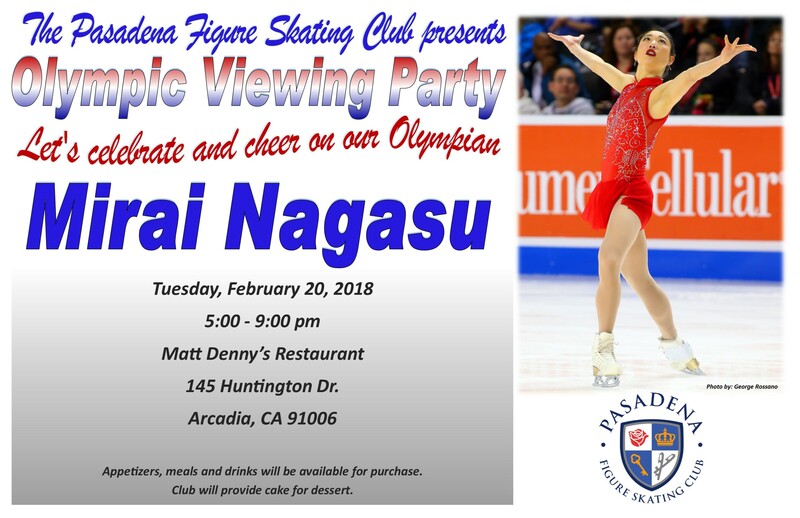 PFSC is organizing a viewing party at Matt Denny’s Restaurant, so that we can all cheer on Mirai Nagasu on the night of the Olympic individual ladies’ short program! There will be multiple TVs for viewing. Be there on Tuesday, February 20 from 5pm to 9pm. No admission fee, but food and drinks will be up to each attendee to purchase. Happy hour specials (3pm to 7pm) will be extended to the patio area! We hope folks who joined us back in 2010 will be there again, and we also hope that some of our new friends and members will join us! Good luck, Mirai!